It’s only the second class in the le sauce baking academy and can you believe I’m on to pastry already? I’m neither as brave or as stupid as you may be concluding me to be right now. It just so happens that short crust pastry is the one dough I actually do have some (limited) experience with. My mother and my aunt make this basic butter and flour dough to make patties, and my friend Steph and I worked with it several times while we were creating our Srimaican Patties. We just made a batch last weekend and we reconfirmed that it is very, very forgiving even in very, very pathetic hands. We reconfirm that every time we go near it. You don’t want to form or work a lot of gluten in this dough, which means not a lot of liquid (water and the protein in flour create gluten) or kneading. In fact, when the dough comes together, it looks like a crumbly mess that you will have no confidence in, but stay strong and resist the urge to knead the dough into something totally cohesive and smooth. And colder butter, colder pastry overall, means a flakier dough. I like to cut the butter up into tiny cubes, then chill it again in the fridge before working it into the dough. I do work it through with my hands, but I wash or dip them in cold water first, and you can use a food processor if you’d like to take the body heat out of the equation altogether. I’ve made short-crust pastry now with all-purpose flour and I’ve also made it with half all-purpose and half whole wheat flour. I’ve overworked it. I’ve used an egg and I’ve mostly gone sans-oeuf. The good news is, that even overworked, this basic recipe I’m sharing turns out just fine. Even with heavier whole wheat flour mixed in, you get a light and delicious crust. 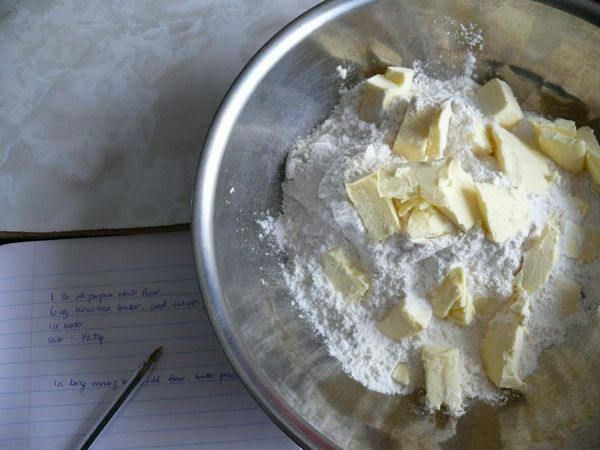 But the way to the flakiest (shortest) short crust is to use white, low protein flour (i.e. not bread flour), work quickly with cold ingredients, and an egg makes for a little bit of a lighter crust too. 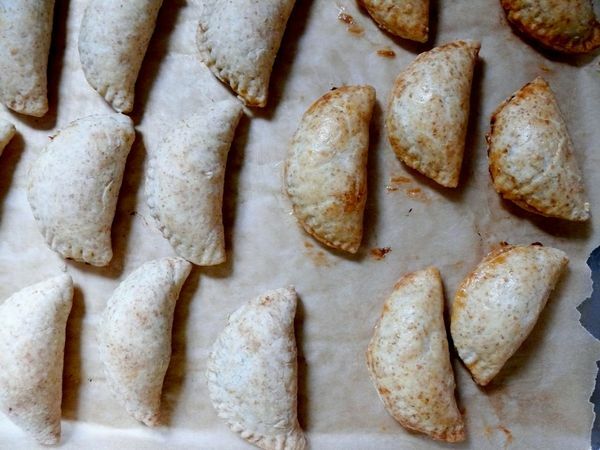 When making something like “hand pies” or these patties, you can take more liberties, because a bit of a stronger dough helps you to hold all of those fillings in anyway. For more delicate recipes, you might want to play by all the rules. Oh, and I’d read that adding an egg to the batter also adds colour and that perhaps you don’t need to brush the pastry with an egg wash before baking. In the photo above, the pastry in the patties on the left included an egg. The pastry on the right did not, but was brushed with a beaten egg before baking. Since I didn’t notice a huge difference in the lightness of the crust, I’m sticking with my mom and aunt’s egg-free dough recipe, and using an egg wash to get that appetizing gold colour. Thus concludes the second installment of the le sauce baking academy–but you didn’t think I was going to let you go without some homework did you? As with the first “class”, I’m relying on you to make sure we get as much out of this as possible, myself included. If you have tips to share, please do so in the comments here and please link to recipes or trials on your own blog too so we can all check them out. If you attempt my recipe, let us know how it goes. And while I’m taking in all of your learning, I’ll be rounding out this lesson by learning as much as I can about short-crust dough before the first Tuesday of next month (June 7), like how much of a difference blind-baking this crust makes, and what if any differences there are between the savory and sweet applications. I’ll post my recap on the 7th so make sure you get your questions and feedback in before then! In a large mixing bowl, add flour, butter and salt. Work butter into flour with cold hands (chill them for seconds in ice water if necessary), or cut it in using a pastry cutter, breaking the cubes into small pieces. You could also use a food processor up to this point, then remove dough and proceed in a bowl or on a flat surface. The key is to work quickly using cold hands and ingredients to avoid the butter from melting at all. Then add ice water (the water only), 2 tbs at a time to the flour, just as much water as needed to bring the dough together roughly. When the butter and the flour is in pea-sized pieces and still crumbly, turn dough out onto a clean floured surface. 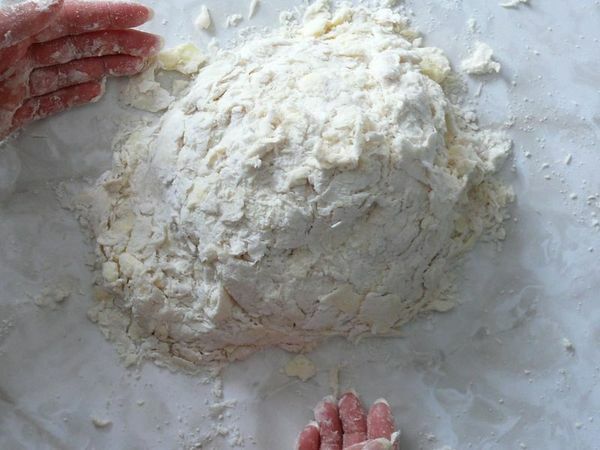 Continue to work dough quickly with hands to combine–do not knead, simply pat it together. Add more spoonfuls of water if needed until just combined into ball, don’t worry if the edges are somewhat crumbly. Wrap dough tightly in plastic wrap and chill in fridge for at least half an hour. Remove pastry from fridge and discard plastic wrap. On a clean well-floured surface, roll out pastry to a 1/8” thickness, or as thick as your recipe calls for. If you are at a loss for what to do with your lovely pastry, may I suggest making these patties. 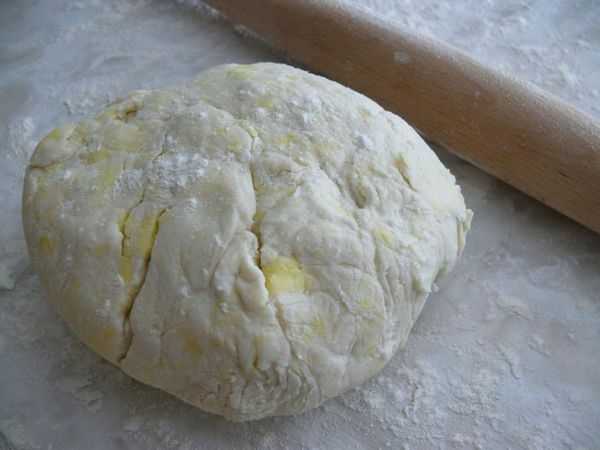 Before baking, brush exposed pastry with a simple egg wash (one beaten egg will do for this amount of dough.) Baked with a pre- or semi-cooked filling, this dough will be perfect and golden after 45 minutes in a 375 degree oven. Makes enough for 1 10-inch tart pan or 15-18 small patties or hand pies. ooh this looks yummy! also the link seems to be broken to the patties recipe. I just fixed it–thank you for letting me know!